If you like pink and need to keep up your pants then come check out this pink Minnie Mouse belt. 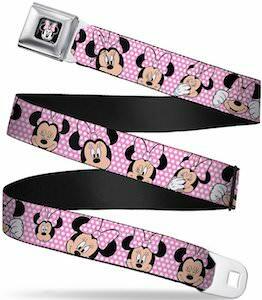 The Disney belt is a seatbelt style belt with a metal buckle with Minnie on it and then the fabric of the belt is pink with white polka dots and on top of that you can find the head of Minnie Mouse with many different expressions. And this Minnie Mouse belt is not made for the kids but more for teens and adults as it comes in two sizes 24 – 38 inch and 32 – 52 inch long and they are easy to adjust to fit you perfectly.